a bread pan or cup-cake tin. This is one time you don't have to grease or flour the pan. Talk to your local butcher and ask them to keep the beef fat cuts for you. When you get the beef fat home, stick it in the freezer while you gather the equipment. The fat cuts easier when it is hardened. Now put the pan on medium heat, and put the fat into the pan and put the lid on. As the fat melts, tip the pan so that the liquid gathers at one side. When it looks like all of the fat has melted, take the pan off the heat and let it cool. Now add fruits, raisins and nuts to the mixture if you choose. Pour the mixture in to a cup cake tin. 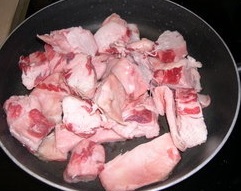 Wait until the fat has hardened and cut the fat in to small pieces and place in storage bags. Place the bags in your freezer. Remove the bags from the freezer when you want to put the food out for your garden birds to eat.